The coat o airms o the Faroe Islands first appear in ane o the mediæval chairs in Kirkjubøur frae aroond the 15t century. 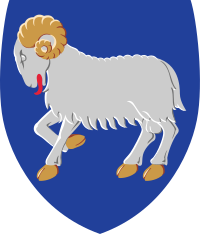 It depicts a Ram (Faroese: Veðrur) on a shield. Later uises shaw a Ram in a seal uised bi the Løgrættumenn, members o the Auld Faroese law Court, the Løgting. The coat o airms went oot o uise when the Løgting wis abolisht in 1816. Efter the Løgting wis reestablished in 1852 an even when the Faroe Islands wur effectively ootside direct Dens rule durin the Breetish occupation in Warld War II the coat o airms wis no uised. Efter the Hame Rule Act came intae force in 1948 the coat o airms came intae uise again. Not bi the Løgting (Parliament) but bi the Landsstýri (Govrenment). The auld title Løgmaður haed been reestablisht, but this time as the leader o the govrenment. The coat o airms follaed him. On 1 Aprile 2004, the Prime Meenister's Office annoonced that frae then on the Prime Meenister an the Prime Meenister's Office woud uise a new version o the coat o airms. This new ane wis based on the oreeginal frae the chairs frae Kirkjubøur. The colours wur inspired frae the Faroese banner Merkið an golden yellae wis addit. The new coat o airms depicts a ram on a blue shield ready tae defend. It can be uised bi Cabinet Meenistries an bi offeecial Faroese representatives, tho some still uise the auld seembol. Wikimedia Commons haes media relatit tae Coats of arms of the Faroe Islands.